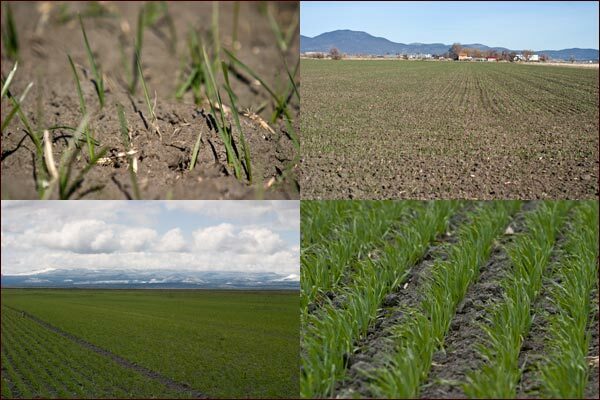 No-Drill Planting and Monitoring of Grain Seed Depth – This no-till drill, on loan from the Klamath Soil and Water Conservation District is planting seeds without distributing the soil surface. This keeps moisture in the ground and prevents erosion from early spring wind. Another upside is that there are far fewer passes of equipment in these fields, saving labor and fuel costs. Farming has a history of adapting. 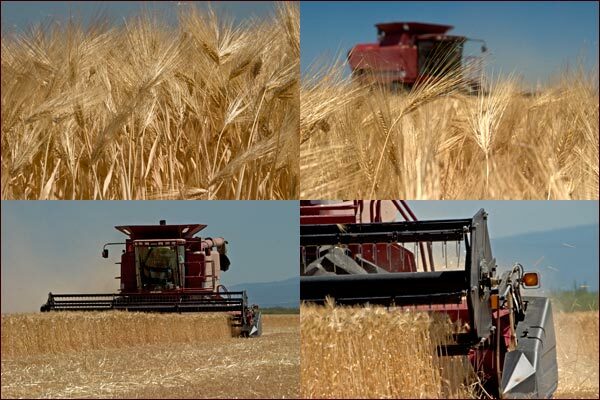 It Is all in the seed – This is white wheat Alpowa seed. Each seed, depending on a variety of conditions, can produce 5 to 9 stalks, also called tillers. Tillers only have one head, which contain 5 to 15 kernels. Uses for white wheat include oriental noodles and cookie dough. A seed is now in the ground. Profitable agriculture is based on extremely close tolerances. There is little margin for error. 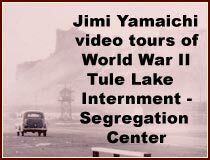 The planting date was April 15, 2005. Timing is everything. 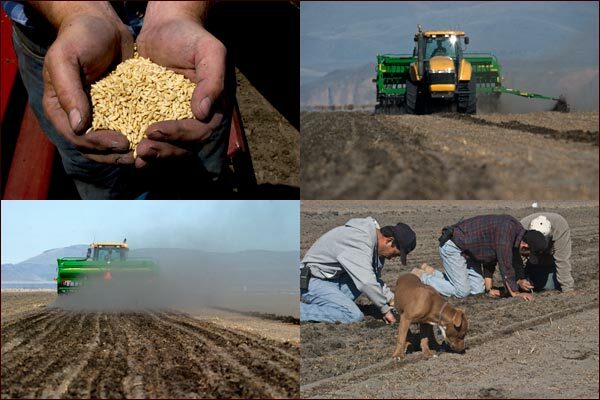 Grain Sprouts Break Through the Ground – Miracles Have BegunFarming is all about management. Watering, fertilizing and weeding are considerations that are influenced by weather conditions and available irrigation water. Nitrogen is a key fertilizing agent. 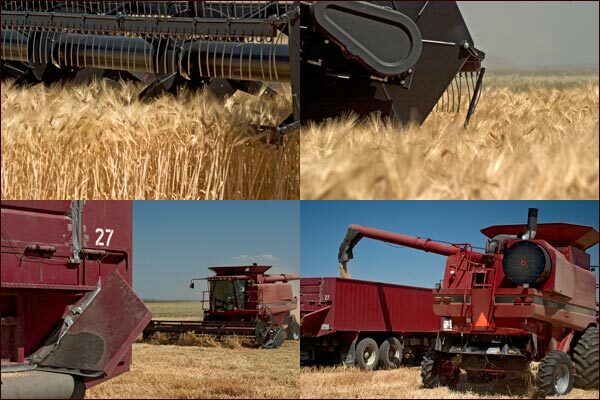 Heavy Heads of Grain Await The Moment That Harvest Machines Arrive – Grain is cut by the header and kernels are separated and up to 5 tons stored in the combine. Chaff is sent flying out the back. These harvest photos are from August 10, 2005. 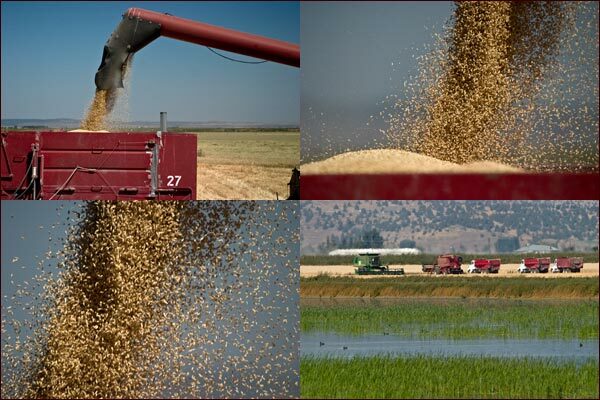 On average a grain crop may take four months from planting to harvest. 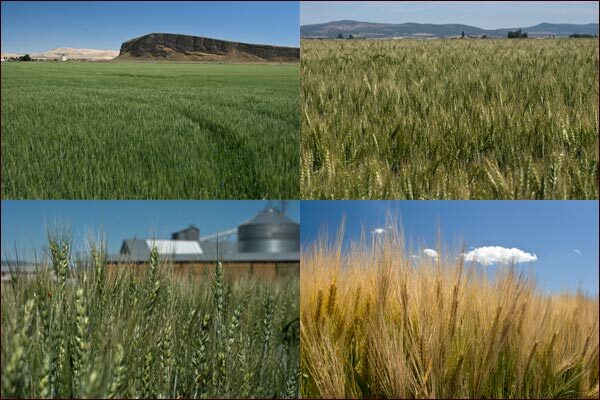 Tulelake wheat and barley have the best yield per acre in the western United States. a truck and will be driven to a scale. 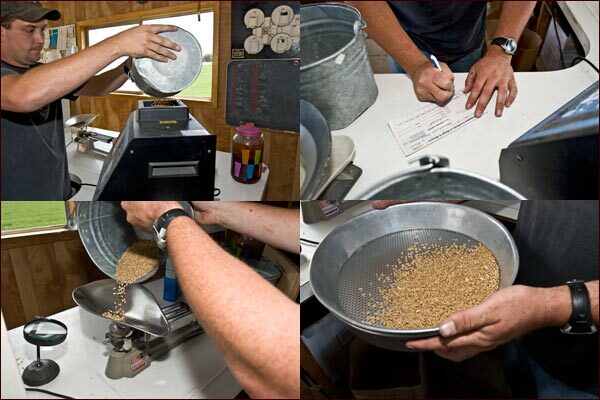 Next Stop for the Grain is The Office to Be Analyzed and Valued. – The truck is weighed fully loaded. 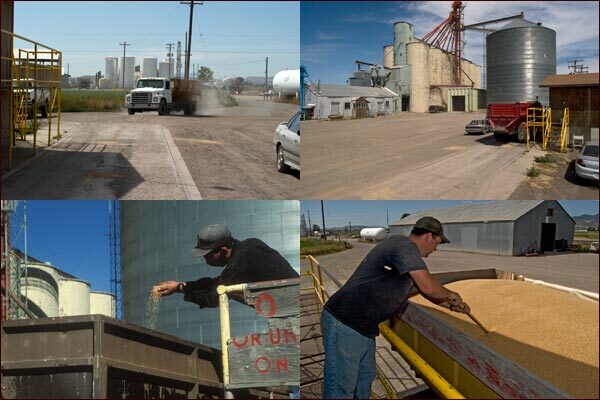 A Small Sample of The Grain From the Truck Will Be Used for Analysis – Farmers bring their grain to an elevator. Here its weighed, analyzed, off-loaded and stored in large bins until sold. 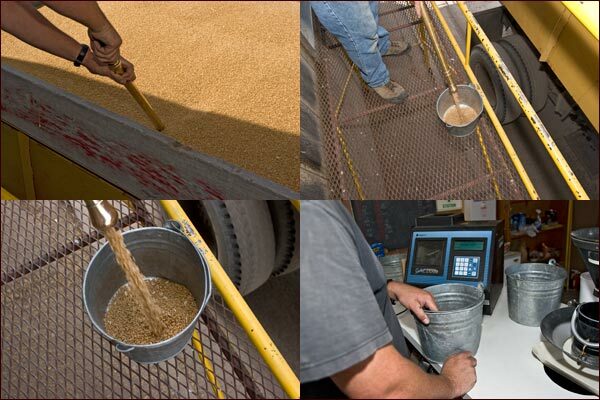 A sample of the load is taken in to be checked for bushel weight and moisture content. 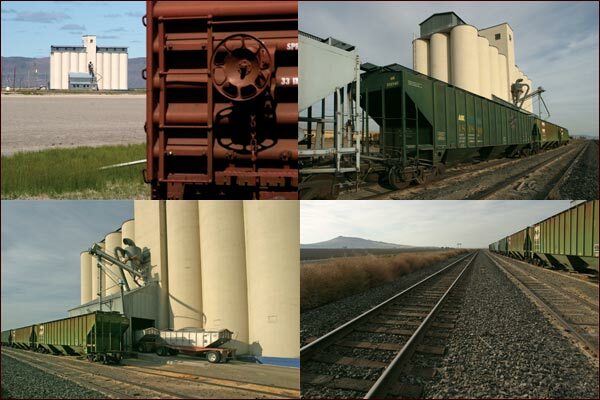 Trucks Are Raised and The Grain Dropped into a Bin and Then Raised Up Into the Elevators. – The truck drives to the elevator. The load drops into a bin. 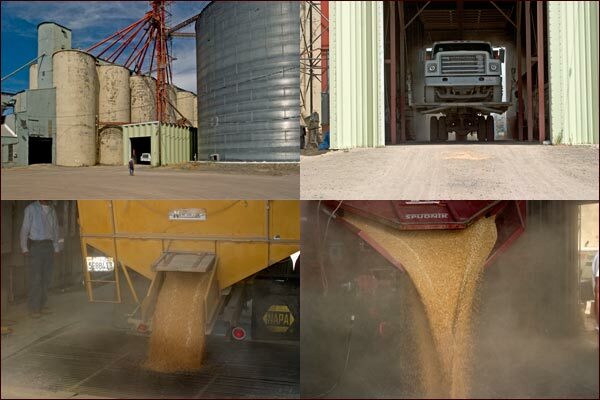 The grain goes by auger to a belt with buckets that takes the grain to the top of the distributor. 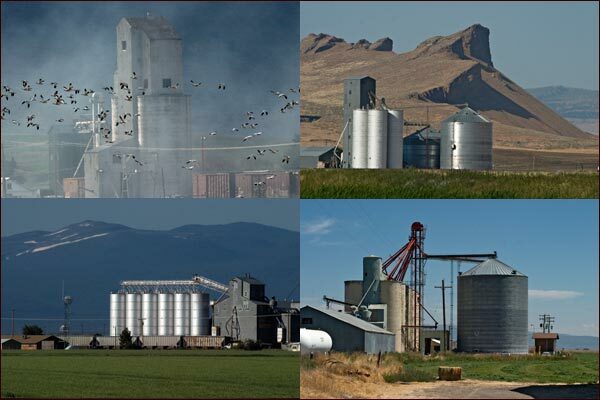 From here the grain is sent to the proper bin for storage. The truck returns to the scales. This gives the grain’s total weight. Lewie Baker remembers grain harvests on a WWII homestead in the 1940’s. 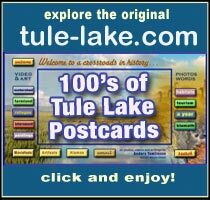 This entry was posted in Tulelake Farming and tagged anders tomlinson, grain harvest, growing grain, tule lake basin, tule lake basin grain, tule lake national wildlife refuge, tulelake california, tulelake farming, tulelake grain. Bookmark the permalink.